Use these homemade soup recipes to make healthy meals that help with weight loss. It’s simpler than you think. With Mama’s handed down recipes, get dinner on the table quickly and easily. My Mom is the expert soup maker in the family and these homemade recipes were passed down starting with Great Grandma. I'm proud to say that's my Mom in the picture below. Mama’s homemade soups were first created during the times where fast food or canned foods didn’t exist. When soups were made with the wholesome vegetables and meats you had on hand. That’s what makes them so special. People always say I love homemade soup recipes, but aren’t they time consuming and hard to make? Not at all, Mama will show you how. Soups were always considered a necessity. After all they provide fiber, vitamins and nutrients. They are also high in water content and low in calories. But my Mom was great because if anyone in the family started putting on the pounds, she started making more and more soup. And yes the pounds started to come off. No one should be denied a bowl of the good stuff, so check out the recipes below that provide the know-how on how to whip together a healthy pot of homemade soup. Love this soup because it focuses on keeping calories low and the nutrition level high. This easy to follow recipe pleases all ages at the dinner table. Not familiar with diet kohlrabi soup? This cruciferous vegetable is very low in calories and great for weight loss as it provides lots of nutrition. The benefits of cabbage soup go far beyond weight loss it also helps with many digestive issues. The beauty of the this cauliflower soup is that you can make it from scratch in less than 30 minutes. Love this recipe. It is a warm meal that is extremely filling, inexpensive to make and has an endless list of health benefits. Deliciously different in flavor and texture this mushroom soup is also packed full of vitamins and nutrients. This recipe just may win the prize on many levels, check out why. Such a great source of fiber this soup makes an excellent meal choice for those battling with cholesterol, heart health and diabetes. You can whip up a pot of this zesty soup for less than ten dollars. A healthy choice that is smart on the pocket book and the waistline. This soup recipe has so many pluses. Not only can you whip this recipe together in about 10 minutes, but it is super low in calories and cost, but high in nutrition and flavor. This meal is a magnificent creation that offers a one of a kind flavor just by adding two extra ingredients. Impress your family and friends with this recipe. For those of you who prefer the taste of whole cooked peas verses pureed, this is the tasty meal you’re looking for. This recipe calls for zero milk or cream and still provides a creamy smooth texture. Served chunky or smooth this meal is sure to be a crowd pleaser. This soup recipe is another great addition to our list of superb low calorie meals and this one offers liver loving veggies, high nutrition and great taste. This diet soup is another creative meal you can add to any weight loss menu. It is easy to make, simply delicious and requires no dairy. This soup recipe is a nice change for the taste buds, offering a unique Mexican flavor. This dish is low in calories and makes a great diet soup for weight loss. This soup recipe is such a perfect meal this time of year. It's warm and filling yet delicious and dietary. This recipe is another clever way to enjoy the fiber, protein, vitamins and minerals that are bodies need. For the person who is on the go, this low calorie but filling dish is a quick and satisfying solution. This homemade soup recipe makes a hearty meal fit for a king that can be made on a shoestring budget. This delectable dish will surely impress your guests. It’s quick, easy and very few ingredients are required. This tasty yet low calorie soup is a family friendly dish which appeals to both young and old. You can create this old fashioned Grandma’s style soup in less than 35 minutes. They will think that you spent the entire day in the kitchen, slaving over the stove. This homemade soup recipe is definitely different by adding one extra ingredient it will taste like you cooked it over an open fire and is undeniably unique and delicious. It is also one of the top hearty soups as it is filled with warmth and energy that can help keep you going strong through most of the day. What's Your Favorite Homemade Soup? Wouldn’t it be wonderful to have a page dedicated to your very own homemade soup creation? 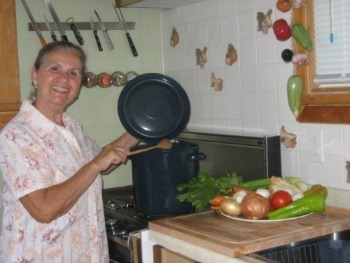 On this page called Mama’s Soup we share with visitors a few recipes that my Mom and Grandmother used when they had to slim down the family, which was quite often as none of us were born with the skinny gene. The belief is all homemade soups were not only delicious, healthy and dietary but a necessity if you want to prevent weight gain. But we only have a few recipes to share which doesn’t provide a whole lot of variety and help for our visitors. Wouldn’t it be great if we could create a collection of homemade soup recipes, your recipes, with each worthy recipe having its own featured website page?